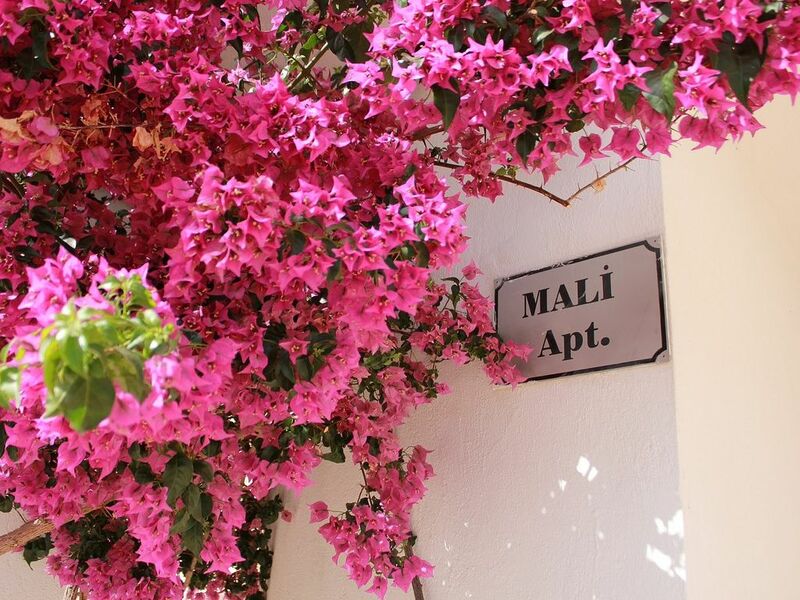 The Mali Apartments are in a perfect location in Kalkan with a fabulous panoramic view of the bay from all rooms. The front of the apartment is designed in a curve accentuating the fantastic sea views from each room. There are only 4 apartments, including ours, so the infinity pool is always peaceful and relaxing with the same lovely outlook. The apartment is in a quiet location and is a 10 minute walk to Kalkan centre and 15 minutes walk to the beach and harbour area. The market and bus station is a 5 minute walk. Tastefully furnished and fully air-conditioned with balconies from the master bedroom upstairs and from the lounge downstairs, plus a French balcony from the twin bedroom. There is a shower room on each floor and the apartment has its own parking space. Relax on the balconies during the day and watch the sunset and Kalkan light up by night. After spending two holidays in this area of Turkey and falling in love with its culture, people and food we decided to buy a holiday home here. We fell in love with this apartment straight away. The curved walls emphasising the fantastic sea views are a real feature, and the views from the balconies of the town and bay are beautiful. Its location is in walking distance of Kalkan and all of its amenities but is also a peaceful and relaxing one. We are sure that you will have a great holiday here and welcome any feedback you have for us. Kalkan village is, in our opinion, the most beautiful along this coastline. It has everything from charming winding streets, great restaurants, lovely unique gift shops and spectacular views of the sea. There is so much to explore in the surrounding area, especially if you love roaming around Roman and Lycian archaeology. We love returning here every time and when we drive from the airport and turn the corner that opens up the view of Kalkan we feel like we have returned home. Fantastic views. Free WiFi. Quiet location. Large infinity pool. Parking space. Shower room and wc upstairs, next to main bedroom. Shower room and wc downstairs, opposite second bedroom. Spacious and light open plan living room with kitchen. Marble floor and beautiful furniture. Curved wall design allowing fantastic panoramic views of Kalkan and the sea. Air-conditioned and balcony. A welcome pack can be provided on request. Please contact us for details and pricing. Oven and hob, dishwasher, washing machine, fridge/freezer, microwave oven, iron, utensils and crockery, kettle, toaster. Outside: The quiet and peaceful infinity pool area is shared with the other three Mali apartments. Our apartment has its own sunbeds and umbrella. Relax and enjoy this beautiful location and views of Kalkan and the sea. Cleaning / Towels / Linen / Maid service: Towels, including beach towels, and linen are included. Weekly cleaning and linen change. Based ourselves in Kalkan and couldn’t have chosen a better apartment. Great view over Kalkan and we did walk into town a few evenings. Apartment was spacious, very clean and well maintained. Rooms were bright and airy.Pool was perfect and soundings very lovely. Couldn’t fault it at all, just perfect. From the moment we made the enquiry Kathryn was brilliant. The apartment is exactly as described and was the perfect accomodation for our ten day return to kalkan. A tough walk back up the hills, but one that we managed twice a day. Although had we not Taxis are easy to come by and very cheap. If you are looking for a good value apartment, not too far from all the fab restaurants of Kalkan with an amazing view then look no further. We had a lovely time in your apartment - lovely sized space with wonderful views and a short walk down into town (taxi back up though). We would definitely book with you again. It's also good to hear that trade has picked up this year for the business owners in Kalkan too (not too much we hope though) - we will be back to book next year. Would highly recommend. Thanks Lisa & Simon. Thanks so much Lisa & Simon. So pleased that you had a lovely holiday and you’re welcome back anytime. We had stayed at Kalkan a few years previous to this trip and really enjoyed the place. This time we had such a fantastic stay, even better than the first, mainly because we knew our way around, but also because this apartment was so lovely. Would highly recommend this apartment. The pictures don't really do it justice, it's just beautiful! We stayed here in early October when the other apts were mostly empty so we had the pool and terrace all to ourselves. Well equipped apartment, lovely top floor room with its own balcony, clean and nicely furnished and good wi-fi which a bonus. The location up the hill is just fabulous with a stunning view over the bay, night or day. The owner was very helpful with transport info and good directions, no trouble to find Mali after a 2 hour run from Dalaman airport. Local info book was also good with plenty of choice although it depends what you are looking for. We found the best food at the off seafront places, especially Ayse's at the bus station which is really authentic and good value. Locals eat here. The Thursday market is worth a look but be prepared to haggle for the genuine fakes. Yes it is very hilly and the hills are steep, but you can walk down into town pretty easily using one of the two footbridges (the left one gets you into the seafront area) and if you are driving parking is easy and getting the groceries is a lot easier. The Carrefour is good. Weather good for the time of year 28 degrees most days but huge lightning storms during the last few days were quite spectacular. Water sports such as jet skiing, kayaking and water skiing. Accommodation is a 15 minute walk from Kalkan beach or a 20 minute drive to the beautiful beach of Patara. Dalaman airport is an 1hr45mins drive away. Car hire is available from the airport or in Kalkan. We can arrange for an airport pickup - please contact us for price. The Dolmus (bus) station is only a 5 minute walk from the apartment which gives you access to all of the local areas, including Patara beach, Kas and Fethiye. Dalaman airport - 1hour 45 minutes. Saklikent gorge - 40 minutes. The area is rich in Roman and Lycian archaeology, including Xanthos, Patara and Letoon all within half an hour away. Kalkan itself is a beautiful place, full of great restaurants, many with rooftop dining areas, and small boutique shops. There are plenty of supermarkets, banks and a couple of Hamam's (Turkish baths). The market on Thursday is worth a visit, and great for your weekly fruit and veg. There is a small beach and harbour area. Booking Notes: 25% deposit to secure your reservation. Balance to be paid in full 8 weeks prior to departure. Plus £100 refundable damage deposit. Price is for accommodation only and does not include flights, insurance, visa, transfers or car hire. Changeover Day: Changeover day and times is flexible depending on availability. Notes on prices: Prices are for the property per week in UK pounds.